Restaurant B.A.R. opens up to the public on November 6th, 2009. The people behind the project is the same people running the well-reputed restaurant Lux Stockholm. The site is available both in Swedish and English. This has been created with the WordPress qTranslate plugin. In order to make it easy for the client to change the opening times, a widget placed above the main menu in the upper right corner was created. 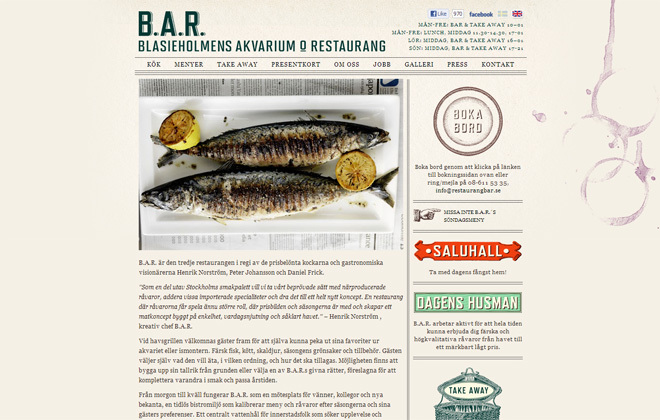 Make your table reservation now or read more about the restaurant at restaurangbar.se.